Attachment Parenting (AP) is a term coined by Dr. Sears to describe a style of parenting that promotes a strong parent/child bond. Although AP is a flexible and family-specific approach, Dr. Sears describes seven tools (listed below) as a starting point for parents. AP is the style of parenting we have chosen for our family and have used since the birth of our oldest child. In some ways, I believe the term "attachment parenting" can be a bit of a misnomer. The natural parent/child bond is strong and takes a significant amount of trauma to break. It was a term, however, which rose in response to an increasingly common form of parenting which encouraged independence in very young infants. As the ideas of "independence" and "scheduled training" became of such importance to even babies, parent/child attachment was affected, the extent to which I believe we have yet to see. AP places a strong emphasis on developing and maintaining that parent/child bond in a very natural and intuitive manner. 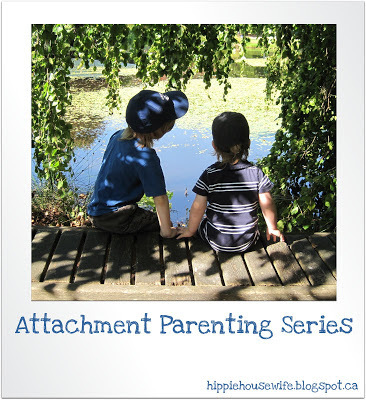 I post a regular series about attachment parenting - what is it, what is it not, how it plays out specifically in our home, what struggles we have had, and what we can do at the community level to make this instinctive style of parenting, well, instinctive again. You can read the Seven Baby B's Summary for an overview of each post. I look forward to continuing this series and hearing your thoughts on the various issues! Is there a particular aspect of Attachment Parenting that you'd like to see explored in the series? Let me know in the comments and I'll be sure to include it! Two more that come to mind... 1) attachment parenting when working with other people's children, for example: teachers and daycare providers. 2) attachment parenting when a nanny or caregiver other than the parent(s) is needed, for example: because a single parent needs to work full-time, parent(s) are too sick, disabled or physically limited to care for the child alone. Great suggestions, thank you! I've added them to the list. Maybe you've already written about this somewhere but, how do we stay an attached couple ("couple-time") when parenting in this manner? Great question; I'll add it to the list. In short, though, we make time together a priority in the evening after the kids have gone to bed. We maintain a close connection with each other during our family activities, and we don't find we need to be without the kids in order to do so. We occasionally go out while the kids stay with family, but this is rare as we have no family nearby. If our circumstances were different, we may have such date nights more frequently; every couple's situation will be unique. Yes, great points. We don't use family as a resource for this even though we have them nearby. Maybe when our DS is a bit older and him and I feel better about the separation. An earlier bedtime for him will help us to have time in the evening together. Rather than being so specific about my suggested topic, I thought about it more later and would love to see it include how to handle different parenting styles, how to help dad feel loved when baby gets so much of mommy's time and attention etc. Thanks so much for all you do here. It's very encouraging. Great suggestions. I had touched on it a bit in my "AP: A father's role" post, but that was more father-specific. I will be sure to add a general "Marriage & AP" post to the list. My husband and I are currently dealing with family members who don't support or agree with AP but want to be caregivers to our children. Grandparents and Aunts who want to have our little ones (2 1/2 and 5mon) for day trips but are disruptive to our family's needs. Do you have any thoughts on how to respectfully handle this? That is a challenging situation. You may find some useful suggestions in AP: Dealing with criticism". Read through the comments in particular, where the issue of grandparents was specifically discussed. I've been reading Dr Sears book and I'm a believer in attachment parenting. Thanks for sharing - I'm looking forward to reading your posts on it. Sleep. Does it really sort itself out? My son is 7.5 months old, our first child. He now naps fairly well on his own (just developed the ability one day, after months of trying to put him in his crib and needing to nap him exclusively in the sling....so there does seem to be hope that at some point independence is an inevitability), but night sleep is hard. He starts the night easily in his crib, but now wakes up every 1-3 hours all night and needs to nurse or be held to get back to sleep. We co-sleep from the time i go to bed until morning and that works well for now, but I would love to know he really will extend his crib-stretches on his own, when he's ready without "sleep training". I actually intended to use Baby wise because so many friends loved it. Yikes!!! Did it ever fail us. I was defeated and discouraged from 3-6 weeks of his little life. He is a frequent nurser, and after 3 weeks old, only napped on me while i walked. I let go of Babywise with my husband's blessing and unknowingly became an AP parent!! It felt natural, freeing, and so in line with my heartfelt desire to listen to my little man's cries and love him to bits. I failed at Babywise because i could never follow their suggestions to let them "fuss a little bit". Anyway, i love parenting this way (even though i try not to label myself AP or anything else), and I can't imagine doing CIO of any kind, but I just worry this night sleep stuff will really cause problems if he doesn't outgrow it on his own. I just started a new blog all about natural parenting! Please follow me on http://naturalhippyinformedantivaxxmama.blogspot.com Any suggestions appreciated. I love this blog! The fight that attachment parents can get from mother in laws and parents who did everything different and are not supportive and even critical about attachment parenting. Or perhaps won't even entertain the notion of having a method at all. Grandparents can be rough on attachment parents....New Hippy Stuff! I cover such topics my self at www.waycrunchy.com but I can't believe that these ideas/methods still aren't mainstream. Breastfeeding isn't even mainstream really past 6 months from what I observe in society. I'm so shocked! I support anyone who spreads knowledge support and exposure of attachment parenting! So Here I am saying, YOU GO GIRL!!!!! I find the most criticism from the online community about the cosleeping.